Interested in project management, computer programming or diagnosing the problem with a heating or cooling system? 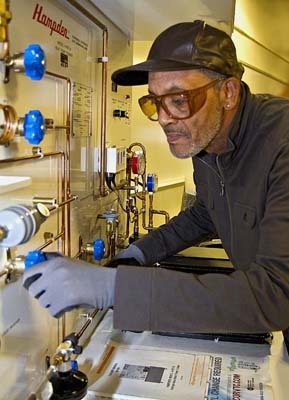 Tidewater Community College’s heating, ventilation, air conditioning and refrigeration (HVAC/R) program trains students for a gamut of job opportunities in a field that is growing at an impressive rate. “HVAC/R has the highest demand for new workers among the technical fields – that’s both in Virginia and across the nation,” said Harlan Krepcik, program head for the HVAC/R program at the Portsmouth Campus. “The income opportunities are there. The job opportunities are there. The future is bright for someone who wants to get into this field. TCC offers a 35-credit, three-semester certificate, and recently augmented its program with a two-year associate degree. Courses range from Air Conditioning and Refrigeration Controls (AIR 111) to Heating Systems (AIR 154) to Psychometrics (AIR 206). Many of the credits earned in the certificate program apply to the associate degree. Approved electives for the associate degree include weatherization, energy management, and supervision and management. While knowledge of basic algebra is helpful, Krepcik said the program is designed to prepare those with no prior background in the field. The program also enrolls veterans with some technical background and current employees within the industry looking to increase their earning potential. Women do quite well, also, Krepcik said, though heavy lifting can be required. The largest misconception about the field is that it’s dirty, blue collar work only. Maintenance and diagnosis are parts of the field – just not the only parts. Krepcik’s first job was for a plumbing and heating operation in Nebraska, manual labor that he didn’t initially find appealing. But he enjoyed math, science, and problem solving and liked the ability to put theory into practice in HVAC/R. He holds two degrees from TCC – one in applied science and another in business – in addition to bachelor’s and master’s degrees from New York Institute of Technology, the latter paid for by his employer. He has taught at the college since 1989 and worked locally for Carrier and Trane. Equal parts lecture and hands-on learning, the TCC program teaches the basic science of HVAC/R – equipment varies from company to company, so some learning is done on the job. While students begin with the basic science of heat transfer, they go on to work with live electrical circuits, wiring, systemic chemicals and materials so cold the mere touch means frostbite. Safety is stressed inside the classroom. While the technical skills are valuable to landing a job, Krepcik said employers seek employees who are strong in customer service, as losing one client in a competitive field is not something they tolerate. The best candidates are also ones who have taken their education seriously.